This tree has brownish-grey tessellated or scaly bark on the trunk, branches and branchlets. The lateral veins in the leaves are more or less parallel to one another as in most other bloodwoods. 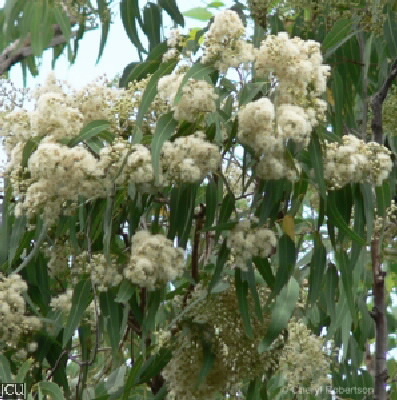 The woody urn-shaped capsule is at least 1.5 times as long as wide, usually about 2 cm long and the valves are deeply enclosed; flowers white in large clusters on the outer edge of the tree.